"The care, time, and personal attention [our daughter] received at PPA has been extraordinary. We eagerly look forward to sending her younger sister in the fall!" “Letter F is for Fire Safety” Week Next! Thanksgiving Week, while short, was a complete success! The students spent the two and a half school days learning all about the events that led up to the first Thanksgiving while creating beautiful Thanksgiving-inspired crafts! Read on below to learn about all that took place throughout this short but fun week! The teachers read a great book about Thanksgiving called Thanksgiving Day by Anne Rockwell. In the story, students from an elementary school classroom are learning and putting on a play all about Thanksgiving! The story introduces the Wampanoag people who lived in the land now known as the United States of America and also the Pilgrims who sailed over from England. The illustrations in the story detail all of the events leading up to the first Thanksgiving – starting with the Pilgrims coming over on the Mayflower and landing at Plymouth Rock. From the story, the students learned that the Wampanoag people taught the Pilgrims, who were new to the area, all kinds of things! Of particular interest was the page about the Wampanoag people teaching the Pilgrims how to hunt and prepare turkeys for food! After all, turkeys did not live in England so the Pilgrims had never seen them before! The students could hardly believe that this is the reason why most of us eat turkey on Thanksgiving today! After hearing the story, the students had an opportunity to create their very own turkey. Unlike the turkeys that will be served on Thursday, these turkeys were not for eating – they were tissue turkeys! 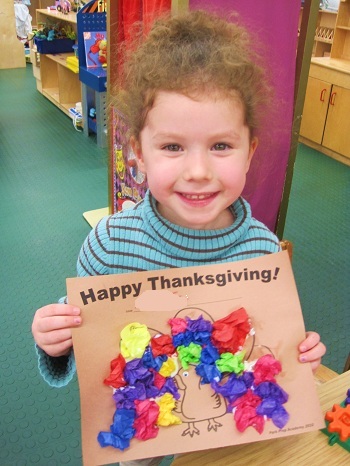 Here is one student proudly displaying her completed tissue turkey! In the afternoon on Monday (and Tuesday), the students had to brainstorm what they were most thankful for this Thanksgiving season. Each student took a turn coming over to the teachers to share what he/she was thankful for. Their words were recorded on a paper and then the students illustrated the page. Each illustration was put together to create, Our Class Thanksgiving Book. Be sure to watch below to see the video of a read aloud of the entire book. 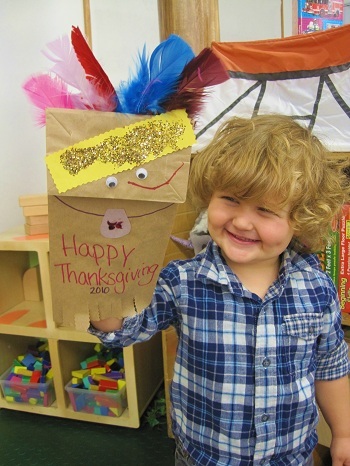 On Tuesday, the students crafted a Native American paper bag puppet. 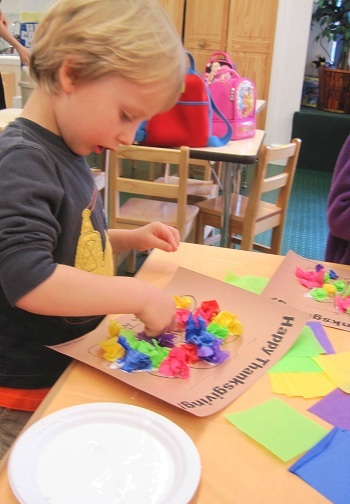 First, the students had to create the most recognizable feature – a headdress with feathers! 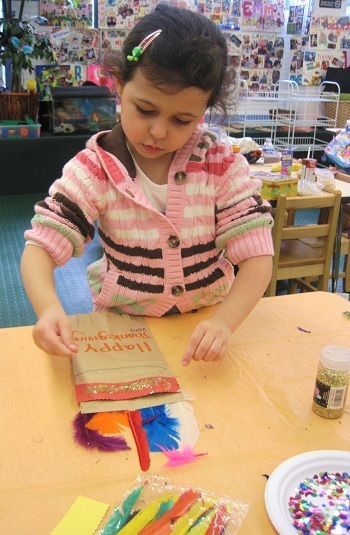 Using some glue, the students designed their headdress with glitter and attached it to the top of their puppet. 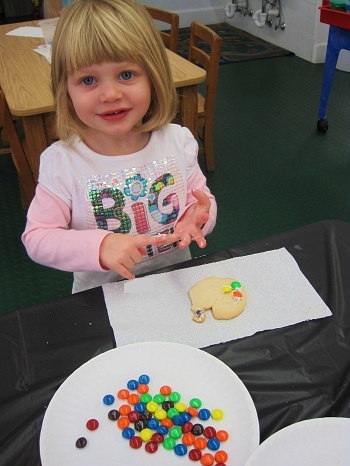 Next, the students attached eyeballs and added a smile to bring their puppet to life! In order to complete the puppet, the students had to add a pendant necklace and select a sparkling sequin to add to it. With a little help from some squiggly scissors, the bottom of the puppet was made to appear like a fringed and tan piece of clothing. From the look on the student’s face below it is clear to see that these puppets were quite exciting! On Wednesday, the students came to school for a half-day but it surely did not affect the level of learning and fun that took place! 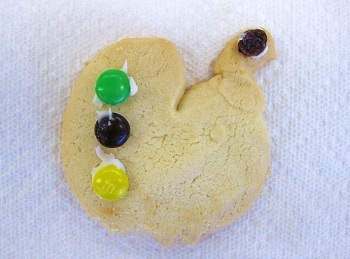 The students spent the morning decorating their very own turkey cookie that Miss Caitlin had baked. Needless to say, the tasty turkeys were a welcome addition to the Wednesday morning snack! Well, that is all for Thanksgiving Week. As always, everyone at Park Prep Academy thanks you for reading and hopes you have a wonderful, safe, and yummy Thanksgiving weekend! See you next week! Please pack only a snack and drink for your child that day. If you do not wish for your child to eat pizza, please pack a full lunch.